In this class you will use the retired Stampin’ Up! 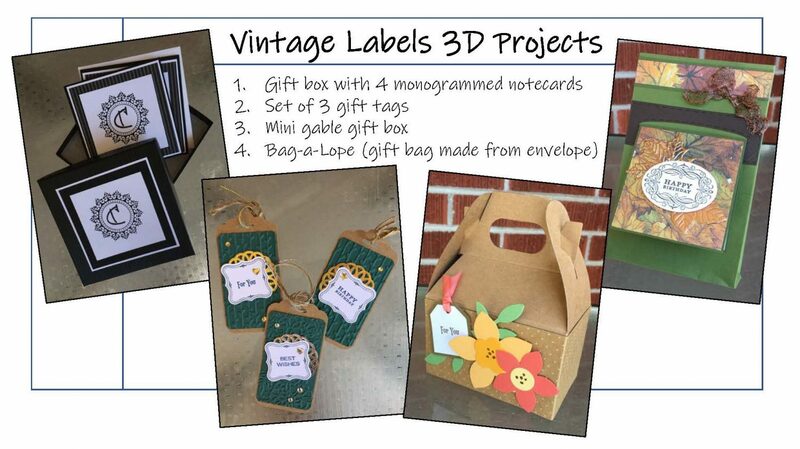 set “Vintage Labels” to make four projects, including a “bag-a-lope” (gift bag made from an envelope), a mini gable gift box, a set of four 3” x 3” notecards in a matching box, and a set of gift tags. No experience necessary – all you need are your favorite scissors and adhesives suitable for papercrafting, plus a desire to be creative! Minimum 3 students, maximum 10 students. If the minimum number of students is not reached, the class will be cancelled and a refund issued.